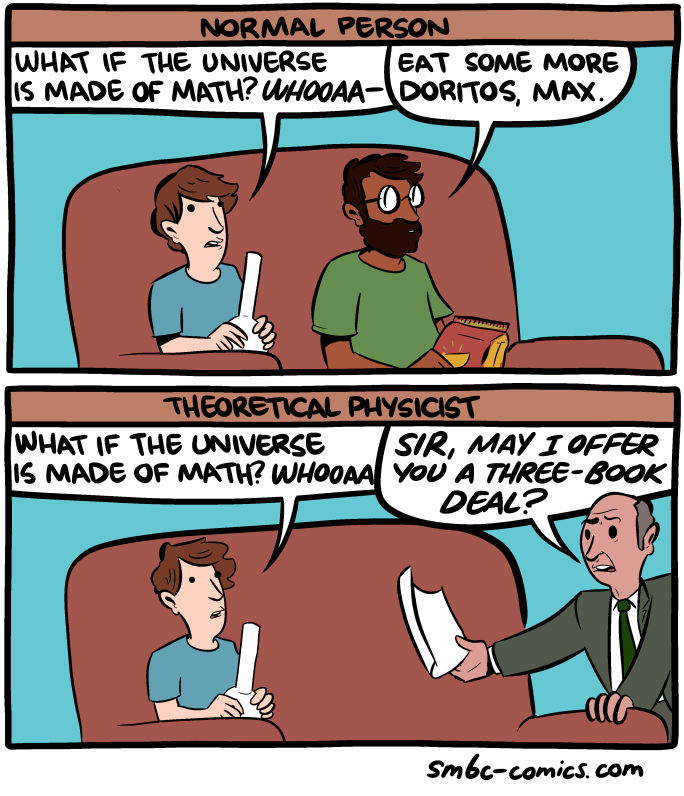 I loved this SMBC. It echoes something I’ve observed before, that some physicists have disdain for philosophy, while often engaging in it themselves. I’ve discussed the question before on this blog on whether the universe is mathematics, mathematics is the universe, or some weird combination. Personally, I’ve gradually become more convinced that the foundations of mathematics and logic are empirical, that they are our most fundamental theories about how the universe works. This isn’t completely intuitive because we are born with some logic and quantity cognitive pre-wiring, giving the illusion, perhaps, that it comes from somewhere else. I recently read Andy Weir’s novel: ‘The Martian‘. Weir’s book is a self publishing success story. An admitted life long geek, he enjoyed thoroughly researching how a mission to Mars might work and what might go wrong with it. He originally published the book, in serialized form, on his web site. In response to reader requests, he put it in a Kindle book on Amazon. It was so popular he was offered a deal with a traditional publisher and a movie deal, almost simultaneously. The version I read was a Kindle book published by Broadway Books. The film, which is directed by Ridley Scott, and starring Matt Damon, will be coming out in October.